Joseph M. Beck, Partner, and Alison Roach, Associate, Kilpatrick Townsend & Stockton, discussed some of the major copyright cases they have worked on including Estate of Martin Luther King, Jr. v. CBS, Authors Guild v. Google, and Authors Guild v. HaithiTrust. Duke Law's Center for International and Comparative Law presents Professor Rochelle C. Dreyfuss of NYU School of Law in a discussion of international intellectual property law and her new book (with Graeme B. Dinwoodie), A Neofederalist Vision of TRIPS: The Resilience of the International Intellectual Property Regime (Oxford Univ. Press, 2012). » View the webcast. "Theft: A History of Music"
We are in the midst of the music wars. Each side tells its story in black and white. On one side, the story is of a generation of lawbreakers, pirating or remixing music without authorization, indifferent to artists' needs. On the other side, we hear about record companies resorting to the law to prop up an obsolete business model, while trying to criminalize new forms of creativity and access enabled by technology. These clashes are presented as a creature of the digital age. But in fact they are not new battles – they are nearly as old as music itself. Plato argued that mixing musical modes should be banned by the state. The Holy Roman Empire tried to use notation – a new "technology" at the time – to force orthodoxy on religious music, and ironically gave composers a tool for disruptive innovation in the process. In the Renaissance, music publishers were actually granted monopolies over printing any music, to support their new printing technologies. Classical composers borrowed routinely in ways that would almost certainly be illegal today. And when we turn to the history of rock music, we find one huge mashup – crossing lines of genre, class, and especially race. Would jazz and soul have been illegal if they had been developed under today's copyright laws? What can history teach us about today's music wars? Ranging over 2000 years of musical history, Jenkins' talk will try to answer these questions, exploring the role that law, technology, and culture have played in the development of music – from ancient Greece to hip hop, sampling and digital remix. The talk will be illustrated by sneak previews from the forthcoming comic book on musical borrowing and regulation that she is co-authoring with CSPD Faculty Co-Director James Boyle and UC Davis School of Law Professor Keith Aoki. Jennifer Jenkins is the Director of the Center for the Study of the Public Domain at Duke Law School, where she runs the Arts Project, an initiative analyzing the effects of intellectual property on cultural production. "A Song's Tale: Mashups, Borrowing and the Law"
On August 29th, 2005, a hurricane made landfall in Louisiana. The forecasters called it Hurricane Katrina, quickly shortened to Katrina as its story took over the news..."
These lines come from Professor James Boyle's new book, The Public Domain: Enclosing the Commons of the Mind, published in November 2008 by Yale University Press. In this lecture, Professor Boyle discussed the history of a single song – a protest song about the government's inept response after Hurricane Katrina – and traced its lineage back through more than a century, with stops in the work of Kanye West, Ray Charles, Clara Ward and many others. Each of these musicians borrowed from the music of others before them, yet they borrowed in different ways, under different legal rules, in a different musical culture. Their music was shaped, for better and worse, by those constraints. At the end of the 100 year journey, we can have a sense of how the music of the future may be shaped, and of what our musical culture will give up in the process. This program featured an exciting panel discussion of “Microsoft Corporation v Commission of the European Communities”, offering an in-depth analysis of the European Commission’s case. The distinguished panelists included: Renata Hesse, a leading technology antitrust attorney and former chief of the Networks and Technology Enforcement Section of the Department of Justice”s Antitrust Division; Cecilio Madero, Director, COMP.C (Markets and cases II: Information, Communication and Media) of the Directorate General for Competition at the European Commission, who worked extensively on the Microsoft proceedings; Barak Richman, a professor at Duke Law School who specializes in antitrust law; and Mark Webbink, the former general counsel of Red Hat, Inc., who participated in the proceedings on behalf of Red Hat, the Software Information Industry Association, and the European Committee for Interoperable Systems. "Musicians in Copyright's Federated Domain"
Why is music taking center stage in contemporary debates about copyright policy, and should it? To put this question in historical perspective, this talk first looks back to examine how and why music first came within copyright's domain. Focusing on the story of music copyright illuminates a dialectic relationship between the practices of particular creative communities and the organizing principle of authorial rights. From this perspective, Carroll argues that it is better to understand the concept of copyright as supplying an organizing principle for a federation of creative communities, each with distinct features and needs that should be reflected in the law. Carroll is Professor of Law at Villanova University, where he focuses on intellectual property and the law of the Internet. He currently serves on the Board of Directors of Creative Commons. His publications include: "Fixing Fair Use," 85 N. C. L. Rev. 1087 (2007), "One for All: The Problem of Uniformity Cost in Intellectual Property Law," 55 Am. U. L. Rev. 845 (2006), "The Struggle for Music Copyright," 57 Fla. L. Rev. 907 (2005), and "Whose Music Is It Anyway? : How We Came To View Musical Expression As A Form of Property," 72 U. Cin. L. Rev. 1405 (2004). Professor Jessica Litman, Michigan Law School:"Copyright Liberties"
In this talk, Professor Litman challenged the conventional paradigm of copyright statutory interpretation, under which unlicensed uses of copyrighted works are deemed infringing unless excused. That rubric was never accurate, she argued, and relying on it has distorted our thinking. In particular, it has encouraged us to give short shrift to the core importance in the copyright scheme of reading, listening, viewing, watching, playing and using copyrighted works. For most of its history, copyright law was designed to maximize the opportunities for non-exploitative enjoyment of copyrighted works in order to encourage reading, listening, watching and their cousins. Litman termed the freedom to engage in those activities "copyright liberties", and argued that they are both deeply embedded in copyright's design and crucial to its promotion of the Progress of Science. Litman is a Professor at the University of Michigan Law School, where she teaches copyright law, Internet law, and trademarks and unfair competition. Litman is the author of the influential book Digital Copyright, and the coauthor with Jane Ginsburg and Mary Lou Kevlin of a casebook on Trademarks and Unfair Competition Law. Dr. Robert Hunt, Senior Economist, Federal Reserve Bank of Philadelphia: "The Geography of Innovation in the U.S. – A Tale of 280 Cities"
In the U.S. inventions (as imperfectly measured through patents) are an urban phenomenon. Why is invention concentrated in cities? Why are some cities more innovative than others? This talk describes some findings from Dr. Hunt's work with Jerry Carlino and Satyajit Chatterjee. They demonstrate the importance of many intuitive factors including: local human capital; local investments in private, academic, and government R&D; and the historical mix of local industries and technology. But they also present other, less obvious, results. For example, larger cities are generally more innovative, but the optimal city size is modest--about the size of Raleigh Durham. Dense labor markets (jobs per square mile) are also positively related to innovative productivity. This fact may be due to more efficient matching between workers and firms in thick markets or, more generally, some form of knowledge spillover between firms. Finally, they find that cities where the average firm size is smaller (and presumably younger) are also more innovative. This suggests that new business formation may be a key driver of innovative productivity in U.S. cities. Dr. Hunt is a Senior Economist with the Research Department of the Federal Reserve Bank of Philadelphia. His fields of interest include innovation & intellectual property, economic geography, and consumer payments & finance. His recent articles include "Matching and Learning in Cities: Urban Density and the Rate of Invention" (with Gerald Carlino and Satyajit Chatterjee, forthcoming in the Journal of Urban Economics), "An Empirical Look at Software Patents" (with James Bessen, forthcoming in the Journal of Economics and Management Strategy), and "When do More Patents Reduce R&D?" (American Economic Review, Papers & Proceedings, Vol. 96 (2006): 87-91). Professor Justin Hughes, Cardozo School of Law: "Champagne, Feta and Bourbon – The Spirited Debate About Geographical Indications"
"Geographical indications" (GIs) are a controversial kind of intellectual property recognized under the TRIPS Agreement. The international debate over GI protection frequently focuses on a few hot-button words – words like Champagne, Parmesan, Parma ham, Chablis, and Budweiser – all of which are claimed exclusively by European countries. Professor Hughes' talk discussed such terms, and explored broader issues of strong GI protection, including questions over consumer welfare, genericness, agricultural policies in relation to globalization, and the monopoly rents that come from control of place names with powerful evocative uses. Professor Hughes teaches at Cardozo Law School. 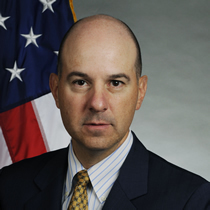 From 1997 to 2001, he worked as an attorney-advisor in the U.S. Patent and Trademark Office, focusing on the Administration's initiatives in Internet-related intellectual property issues, intellectual property law in developing economies, and copyright appellate filings for the United States (including the Napster litigation). James Bessen, Director, Research on Innovation:"Empirical Evidence on Patents: Do they work like property?" Do patents promote innovation and economic growth like property rights do? James Bessen addressed this question by reviewing empirical research on patents, including historical research, cross-country studies, estimates of patent value and estimates of litigation costs. Bessen focused on a disturbing trend: in many industries, patents are actually decreasing the incentive to invest in innovation. He argued that this has happened because the law has changed to make patents less like property. For example, in many areas it is hard to know what the boundaries of patent claims are, discouraging licenses and encouraging disputes and litigation. Bessen has been both an innovator and a research economist: he wrote one of the first desktop publishing programs in the early 1980s and became CEO of a successful software company. After selling the company, Bessen has done research on innovation economics at MIT and Boston University. Professor Koleman Strumpf of the University of North Carolina-Chapel Hill: "The Effect of File Sharing on the Sale of Entertainment Products: The Case of Recorded Music and Movies"
For industries ranging from software to pharmaceuticals and entertainment, there is an intense debate about the level of protection for intellectual property that is necessary to ensure innovation. In the case of digital information goods, web-based technologies provide a natural crucible to assess the implications of reduced protection because these technologies have drastically lowered the cost of copying information. This talk discussed empirical evidence of the crowd-out effect of file sharing on entertainment products such as music and movies. Professor Strumpf's research on P2P file sharing has been featured in The New York Times, Wall Street Journal, Washington Post, Rolling Stone, and Nightline. Professor P. Bernt Hugenholtz of the University of Amsterdam, Institute for Information Law -"Creative Commons and Authors' Rights: Les extrèmes se touchent"
Conceived from radically different visions of copyright, American-bred Creative Commons and Old Europe-style authors’ rights (droit d’auteur) have more in common than initially meets the eye. Focusing on the rights and freedoms of creators, both systems recognize certain inalienable moral rights, such as a right to attribution and a right of integrity. Moreover, for both systems to achieve their professed goals, it is vital that copyright in works of authorship remain with the actual creators, and not be transferred to the media companies or collecting societies that wish to exploit them. Therefore, certain statutory limits to freedom of contract aimed at preventing (overly) broad grants of rights are required. Strong author-protective contract rules currently exist in many traditional authors’ rights countries, such as France and Germany, and may serve as examples for the United States. Bernt Hugenholtz is Professor of Intellectual Property Law, and Director of the Institute for Information Law of the University of Amsterdam (IViR). He is Legal Project Lead of Creative Commons, the Netherlands. Professor Eric von Hippel of the MIT Sloan School of Management: "Democratizing Innovation and Norms-based Intellectual Property Rights"
Innovation is increasingly becoming "democratized" as users develop products for themselves. Many freely reveal what they have developed to a commons. Others, however, appear to assert some rights to their innovations on the basis of community social norms. Professor von Hippel provided an overview of democratized innovation, and then describe a case study of informal recipe rights expectations among French chefs. Professor von Hippel is Head of the Technological Innovation and Entrepreneurship Group at the MIT Sloan School of Management. His research is focused on the nature and economics of "distributed" innovation. Computation is transforming research in the biological sciences. While such research has historically emerged from individual labs that focus on discrete questions, it is increasingly borrowing from open and collaborative models prevalent in software and high-energy physics. Intellectual property law will play an important role in facilitating – or perhaps undermining – the emergence of these new models. This talk explored the role of law as well as the larger question of whether "open source" models are likely to advance social welfare. Professor Rai, a leading expert in patent law, law and the biopharmaceutical industry, and health care regulation. Professor Daniel Kevles of Yale University: "Patenting Life and Its Parts: Ethics and Rights in the Political Economy of Intellectual Property"
Since the late 1970s, patents have been issued on living organisms and their parts, including microrganisms, plants, animals, and genes. These developments enjoy strong support in a number of quarters, including the biotechnology industry, university technology transfer offices, and the patent bar. However, they have also stimulated widespread dissent in the academy and among patients' rights groups, religious groups, and social activists. Part of the dissent is ethical, a consideration that has no place in U.S. patent law but does explicitly appear in European patent law. Professor Kevles discussed these and other issues during his lecture. Kevles is the Stanley Woodward Professor of History and Adjunct Professor of Law at Yale University. Duke Law Professor Catherine Fisk:"Working Knowledge: Employee Innovation and the Rise of Corporate Intellectual Property, 1800-1930"
Professor Fisk presented her work examining the rise of corporate ownership of intellectual property in the nineteenth century. This work is based on extensive research into nineteenth century law as well as the practices of several large and small firms, including Dupont, Rand-McNally, and law book publishers, that employed people who created patented and copyrighted works. It argues that the rise of corporate intellectual property necessitates development of an alternative non-property regime to acknowledge and reward innovation by employees. Professor Fisk is currently writing a book on intellectual property rights in the nineteenth-century employment relationship. James Love, Director, Consumer Project on Technology: "A New Trade Framework for Global Healthcare Research and Development"
James Love, one of the most influential activists and thinkers in the area of access to medicines and the director of the Consumer Project on Technology, presented a proposal for reforming the international system of incentives for the production of medicines. The proposal, which Love developed with Tim Hubbard (head of human genome analysis at the Sanger Institute in Britain), is designed to ensure access to medicines for the diseases of the global poor, as well as to deal with some of the perceived problems in the drug patent system in the US. One of the oddest things about the United States patent system is that it is impossible for the U.S. Patent and Trademark Office to ever finally reject – or grant – a patent application. The culprit is the "continuation" application, which has allowed abuse of the patent system by what have been called patent "trolls". Professor Mark Lemley presented the results of his empirical study with Kimberly Moore on abuse of the patent continuation process, and argued that the current system must be abolished or at the very least radically reformed. Lemley is the William H. Neukom Professor of Law at Stanford Law School. Professor James T. Hamilton of Duke University's Terry Sanford Institute of Public Policy: " All the News That's Fit to Sell: How the Market Transforms Information into News "
That market forces drive the news is not news. Whether a story appears in print, on television, or on the Internet depends on who is interested, its value to advertisers, the costs of assembling the details, and competitors' products. Furthermore, many complaints about journalism--media bias, soft news, and pundits as celebrities--arise from the impact of this economic logic on news judgments. In his recent book, All the News That's Fit to Sell, Professor James Hamilton shows how this process actually happens. In his lecture, Professor Hamilton presented this work, examining how economics helps explain perceived problems with the news media and discussing possible remedies for market failures in journalism. Hamilton is the Oscar L. Tang Family Professor of Public Policy at Duke University's Sanford Institute of Public Policy. Professor Robert Cook-Deegan, M.D., of Duke University: "Technology, Science, Money, and Health: A Policy History of Genomics"
Professor Robert Cook-Deegan, M.D., reviewed the changing goals of genome sciences from the conception of the Human Genome Project in 1985, through formation of genomics startups in 1993, to the genomics boom of 1999-2000, to the public release of a reference genomics sequence in 2003 and the current focus on applying genomics to health care. This lecture included a focus on the role of patents, databases, and proprietary secrecy at various stages and for particular companies and research institutions. It also pointed to the shifting policy priorities of genomics from getting public funding for science to privacy, discrimination and intellectual property, and thence to health policy financing, coverage, quality of care, and public health surveillance and intervention. Cook-Deegan is director of the Center for Genome Ethics, Law, and Policy at Duke, and author of The Gene Wars: Science, Politics, and the Human Genome. Professors Tracy Lewis and Jerome H. Reichman of Duke University, "Saving the Patent System from Itself: Some Thoughts on Compensatory Liability Rules"
The patent system of acquisition and protection is now frequently criticized on numerous grounds, including its manipulability, its susceptibility to abuse and holdup, its regional specificity, its differential treatment of leaders and laggards, and the agency costs that are present not only among business competitors, but among the very bureaucrats and judges who administer the system itself. In this lecture Professors Lewis and Reichman discussed the law and economics of compensatory liability rules as a possibly preferable alternative to property rules for inducing innovation and encouraging follow-on development of intellectual property. Professor Lewis has written extensively on the theory of incentive contracting, regulation and industrial organization. Professor Reichman has written and lectured widely on all aspects of intellectual property law. Professor Boyle discussed Creative Commons, a digital non-profit organization he helped to found, which is devoted to expanding the range of creative work available for others to share and build upon, through the use of innovative licenses that can be read by machines, people and lawyers. Professor Boyle won the 2003 World Technology Award in Law for his work on protecting the intellectual ecology of the public domain, and has played an instrumental role in creating a public interest movement around intellectual property and public domain issues. Recently there has been a heated debate over the regulation of the electromagnetic spectrum. How should the airwaves be managed? Should the government create property rights over frequencies, and allow private parties to buy and trade them? Should the spectrum instead be treated as a “commons,” relying on technological means to deal with the problem of interference? Under what circumstances would a commons make sense? Professor Stuart Benjamin addressed these and other issues in his lecture. Benjamin is a preeminent scholar in telecommunications law whose work has focused on how legal institutions respond to technological change. Professor Cohen considered how effective patents are across different industries in the manufacturing sector, how reasons to patent differ across industries, the role of patents not only in the protection of innovations but in the diffusion of knowledge, the effect of patents on R&D, and implications for social welfare and policy. Cohen is a leading expert on the economics of technological change and R&D, and is currently Professor of Economics and Management at Duke's Fuqua School of Business and a Research Associate of the National Bureau of Economic Research. The music industry is in crisis. The film industry may soon succumb to the same disease. Professor Fisher discussed some legal reforms and business models that, in combination, might offer us a cure. Fisher is Professor of Law at Harvard University and Director of the Berkman Center for Internet and Society. His book, Promises to Keep: Technology, Law, and the Future of Entertainment, was published by Stanford University Press in 2004.